All of the entries to this year’s awards program point to more creative and thinking-outside-the-box interactive technology applications, but several entries– and winners– called out creative and innovative installations or applications that cross over to the world of providers from NAB, ISE, DSE, and InfoComm/AVIXA. The other interesting development revealed by the awards this year was more Smart Cities initiatives including tech-enabled Smart Cities solutions that go beyond just data collection and analysis to include data visualization and large palette visualization of creative content for public spaces. I wrote earlier this week about Moment Factory, and Obscura, who as finalists in the SXSW Interactive Innovation Awards illustrated how the different technology worlds are coming closer to each other. Indeed, Moment Factory, who had a separate video-heavy entry into the Responsive Design category, KONTINUUM, received a well-deserved award Tuesday night in the Smart Cities category, for their other entry, a massive-scaled interactive video LED bridge illumination fixed integration, the Jacques Cartier Bridge, for “inspiration in building a vision and business plan around what integrated, interactive multimedia can do for destinations around the world.” The Jacques-Cartier Bridge Interactive Illumination was a collaboration of forces: concept by Moment Factory, with Réalisations Montréal Inc., Ambiances Design Productions, ATOMIC3, Éclairage Public / Ombrages, Lucion Média and UDO Design. The project directed by Jacques Cartier and Champlain Bridges Inc., Montreal, QC. With intelligent programming connected in real-time to big data and social media networks, the bridge is by most measures the most connected bridge in the world. It comes alive every night and changes constantly, in synch with Montreal’s seasons, weather, traffic and social media activity. Sensors installed on the bridge track vehicle, bicycle and pedestrian traffic, as well as wind speed, wind direction and precipitation levels. A winner also emerged from DOOH/digital signage arena, in the Responsive Design category: space150, of Atlanta, for their huge LED billboard in Times Square for Coca-Cola. Certainly one of the top trends at SXSW 2018 is VR. I have written in these pages about the need to move the VR discussion, and market, away from just VR headsets, and more toward “collective”, shared VR experiences. That need is not on everyone’s mind here– there is still too much thinking that VR is nothing but a headset, solo experience. That being said, there is some amazing headset-based VR on display at SXSW. Stay tuned for a full report on VR at SXSW and beyond. In the VR & AR category of the SXSW Interactive Innovation Awards, honoring breakthroughs in augmented and virtual reality, the winner was Maestro, from Penrose Studios, of San Francisco. A panel of judges comprised of industry peers and experts selected the winners based on four criteria: creativity, form, function and overall experience, except for the People’s Choice Award. 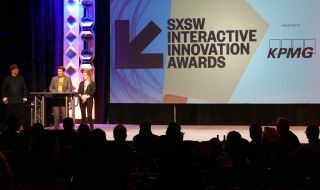 SXSW Interactive attendees voted for the People’s Choice Award at the second annual Innovation Award Finalist Showcase on Sunday, March 11, where the 65 finalists had the opportunity to exhibit and demo their work. Thirteen awards and six special honors, including Best of Show, People’s Choice, Breakout Trend of the Event, Speaker of the Event, Meme of the Year and the David Carr Prize, were presented to esteemed innovators for exceptional work spanning categories from AI & machine learning, to the ever-evolving world of wearable tech, music & audio innovation, healthcare, responsive design, and more. Awarded for the best essay submitted from writers, bloggers and journalists, Amanda Gail was this year’s recipient of the David Carr Prize. Created in 2016 to honor the late David Carr, a friend and great contributor to SXSW and the journalistic community, Gail’s essay focuses on the mind-blowing changes the future will bring, and how humans still need to figure out what to do with them, something that David Carr himself seemed to understand. Honoring those exceptional trail blazers whose work has helped shape the connected world and who continue to guide the direction of the digital industry, this year’s seventh SXSW Interactive Hall of Fame inductee was Eli Pariser, author, online organizer and the President of Upworthy and GOOD Worldwide. During the ceremony, Eli stressed the importance of sharing one’s power to reinvent and reinvigorate a true democracy. AI & Machine Learning. Honoring digital systems which have the ability to adapt to changing data, stimuli, and circumstances; replicating learning, problem solving, and cognition.